Member Spotlight: Haematologic Technologies, Inc.
Haematologic Technologies, Inc. (HTI) is a small company with broad expertise in protein chemistry and blood coagulation. Their core business involves the isolation of proteins from blood for use by research scientists interested in the study of hematology, blood disorders, and blood coagulation. This precise focus, in conjunction with the small-company benefits of speed and agility, provides a significant competitive advantage to their new division, Haemtech Biopharma Services (HBS). HBS works exclusively with pharmaceutical companies to develop and implement specialized assays and test methods to help companies meet regulatory requirements for drug-product manufacturing, stability and release. Responding to customers’ needs has been a big part of HTI’s success. The company was founded in 1987 by Kenneth Mann, Richard Jenny and other colleagues from the University of Vermont. They recognized that some of their technology offered real commercial potential in the pharmaceutical and in-vitro diagnostics (IVD) industries as well as in the research community. As Richard Jenny, HTI’s president and co-owner describes, “We had a choice of either licensing our technology out to others…or just jumping in and forming a business to do it ourselves. We chose the latter approach.” Since then, HTI has grown from just 2 employees in a 600 square foot laboratory, to 39 employees and almost 20,000 square feet of space, including an ISO 9001:2008 certified manufacturing facility and a new cGMP-certifed, protein-biotherapeutic testing facility. HTI has become the premier global supplier of coagulation-related reagents and services to pharmaceutical, IVD and academic organizations. This core manufacturing business has seen significant growth over the past 25 years, but the new Biopharma Services division currently leads growth in new revenues for HTI. Richard Jenny describes HBS as a “contract service organization with elements of a contract research organization.” They are brought on as a partner, with very specialized expertise, to help manufacturers of coagulation-based biotherapeutics fully characterize drug products, providing support from early stage development to release stability assessment of the final drug product. A key part of their business is the development, validation and implementation of analytical test methods that are required by their clients to meet safety and regulatory requirements. HBS has recently secured long-term contracts for stability and release testing for a hemophilia-based biotherapeutic as well as other agreements for assay development and implementation. Another rapidly growing business segment for HTI is the manufacture of customized, blood collection tubes for CROs, pharmaceutical companies, and research institutions. The success of customized collection tubes has been exponential as more and more clients discover HTI’s service. In addition, HTI has developed its own proprietary blood collection tube which will represent the company’s first product entry into the FDA-regulated, medical device market when it is launched next year. HTI has also utilized its GMP experience to further penetrate into the point-of-care market; they have secured long term contracts to provide controls for home-based coagulation monitors. 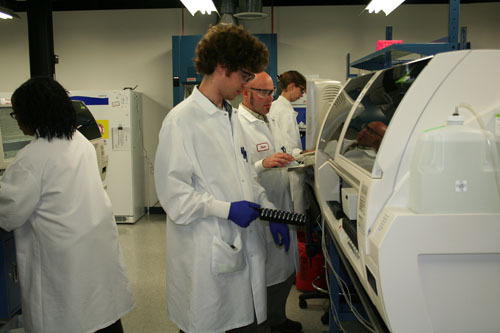 HTI products and services benefit the science community with unique reagents and technologies to advance biological understanding of blood biochemistry and coagulation—an area of research with obvious and important clinical significance that supports the drug development process. Customized blood collection tubes help these same researchers perform clinical studies on the efficacy of the compounds they are developing. Finally the research, development and testing services offered through HBS provide critical support in helping companies test drug products for safety and effectiveness, facilitating regulatory approval of drugs that benefit hemophilia and thrombosis affected patients world-wide. HTI president Richard Jenny values the opportunities for networking provided by the Vermont Biosciences Alliance (VBSA). He notes that HTI has benefitted from his VBSA connections by identifying local scientific resources, brainstorming new ideas, and in the recruitment of new employees.